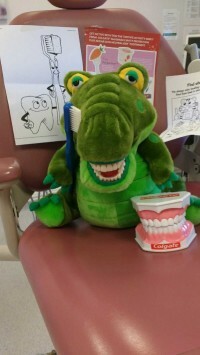 Two of team members recently visited a local school to speak with the reception class about dental health. They had a great time dressing them up as a dentist and were shown how to brush their teeth with Mr Wide Mouth and a huge toothbrush. Each child receive a goody bag containing colouring pictures, quizzes, toothpaste and a 2 minute timer to encourage brushing for 2 minutes twice a day. Thank you to CTS and Colegate for supporting this visit and we are looking forward to returning later this year to talk to some of the older children as part of their science work. This entry was posted in Blog, Dental Health, Oral Health, Practice News on 17th March, 2016 by Causeway & Blackhorse Dental Practices.